Kamusta, traders! We are expanding the lineup of non Graphene gateways, and this time we’re adding a Gridcoin gateway. Even though it doesn’t utilize Graphene technology, it is one of those coins ideas behind which resonate with our team. Also GRC community is quite active on Bitshares RuDEX and has been requesting a listing from us. Finally we have some free time to add this coin. Support our BLCKCHND witness on Bitshares blockchain, your votes support our work. This post received a courtesy vote from @gridcoin-booster! 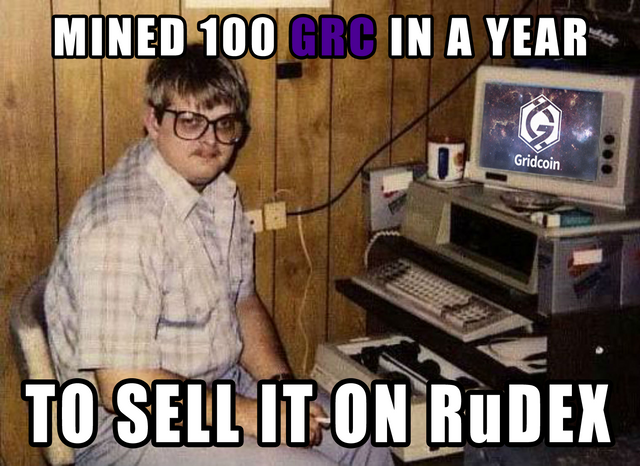 Thank you for your contribution to the #gridcoin community! Good Job ! Hello Rudex ! The picture made me laugh hard.